Congratulations to the people and priests of the Ordinariate in Torbay! 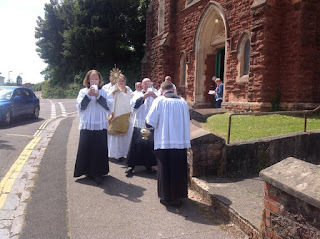 Today, on Ascension Sunday, they become the FIRST personal parish church of the Ordinariate in the UK. Today at 10.30am, the Ordinary, Mgr Newton, celebrated holy mass, conferred confirmation, inducted the First parish priest, and erected the personal parish.